If standing in the right place at the right time, your world will start to get cooler as the sun seems to disappear. Then, it will be dark and chilly. And no, you won’t be watching a sci-fi movie or be experiencing the end of the world as described in mythology. 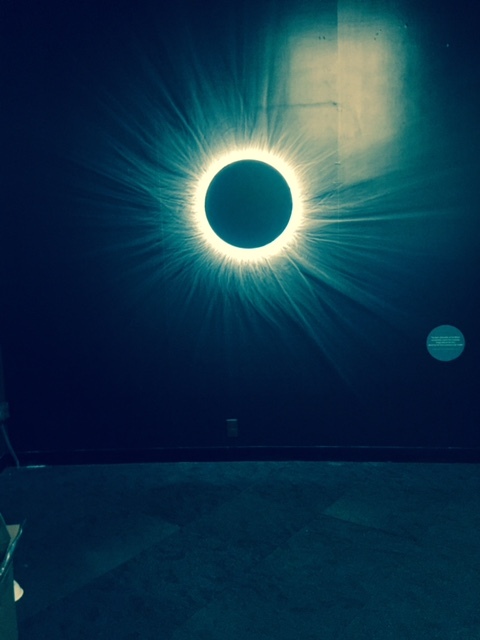 You will be experiencing a total solar eclipse. Unless you plan to be in the south Pacific or South America on Dec. 14, 2020 or in Dallas, Indianapolis or Cleveland, April 8, 2024, your best bet to experience a total solar eclipse is in the United States Aug. 21, 2017 along a diagonal path from Salem, Oregon in the northwest through Carbondale, IL in the Midwest to Charleston, South Carolina in the southeast. In the Midwest, people who travel to Carbondale in southern Illinois will see the moon totally blocking the sun for about 2 minutes and 41.6 sec. It’s actually safe to look when the sun is totally covered then. but not before or afterwards. If you don’t think that’s a long time to be in the dark try watching a clock tick off the seconds. Carbondale, home of Southern Illinois University, is one of the best places to go to because of the long blockage beginning at 1:20 p.m. CDT and because it is one of NASA’s official sites. The Adler will have an event in Carbondale where astronomers and eclipse chasers will converge. Total coverage last about 2 minutes and 42 seconds. You can draw your own line on a map from Salem, OR to Charleston, SC to see what other towns are in the eclipse path. Even though the blockage won’t be as long as in Carbonadale they will have a total eclipse. The towns along the path are all expecting visitors so are hosting eclipse events. For example for Oregon visit Salem, Madras and Oregon for festivals, where to stay and what to do. If near Salem the eclipse is at 10:19 a.m. PDT and lasts 2 min, 4 sec. For Carbondale, go to SIU. Totality there happens at 1:20 CDT. Also check out Charleston where the eclipse ends on US soil. Charleston is in the dark for about one minute, 40 seconds. For other places in South Carolina visit Great American Eclipse SC . Accommodations have been going fast along the eclipse path so if planning to travel to a city where there will be total darkness don’t wait to find a place to stay whether camping or looking for an inn. Those places mentioned are dead center on the path but that doesn’t mean you wont have a great eclipse moment several miles away. 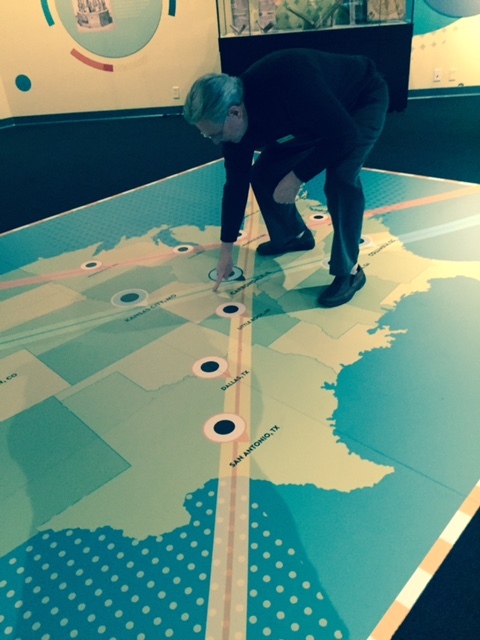 At the Adler’s “Chasing Eclipses” exhibit, astronomer Larry Ciupik points out where Carbondale is on the 2017 eclipse path that goes from left to right. It is bisected by the eclipse path that will run from southeast to north west in 2024. In Chicago, the moon will begin blocking the sun about 11:54 a.m.CDT, reach maximum coverage about 1:30 p.m. and be all the way through by 2:30 p.m.
“While it won’t be absolute total blockage in Chicago, the city will experience a 90 percent eclipse,” said Adler Planetarium astronomer Larry Ciupik. And that is with Chicago located about a six and a half hour drive north of Carbondale. Thousands of people are expected to join the Adler’s watching party, according to Ciupik. Proper glasses will be handed out until the supply is gone. For the Adler’s big eclipse bash visit Adler Eclipse. For official NASA viewing sites visit NASA Event Locations. It’s not OK to look while the moon is moving across the sun even when a little bit of the sun is peeking out. Looking at the sun when there is not total blockage will damage the eyes. See NASA for more eclipse information and NASA Safety for viewing tips. You have to use certified glasses to watch. Another way is to look at the events shadow on the ground by turning your back to the sun and making a peep hole with your hands, one in front of the other as described on the NASA safety site. So take advantage of the event by making it a summer vacation but don’t wait to make arrangements.